The Battle of the Frontiers was a series of battles fought along the eastern frontier of France and in southern Belgium shortly after the outbreak of World War I. The battles represented a collision between the military strategies of the French Plan XVII and the German Schlieffen Plan. The British Expeditionary Force (BEF) fought a relatively minor battle at Mons which, by virtue of its position facing the critical right wing of the invading German army, had a significance that far exceeded the number of men engaged or casualties inflicted. The defeat of the French offensive in the Battle of the Ardennes led to a general retreat to the Marne River where the French and British forces regrouped for the defense of Paris. The objective of the French Plan XVII was to recapture the provinces of Alsace-Lorraine, lost in the Franco-Prussian War of 1870, pinning the German forces on the Rhine, and to attack the German centre through the southern Ardennes. In opposition to Plan XVII, the German Schlieffen Plan anticipated the target of the French assault and determined to remain there on the defensive, holding the Alsace-Lorraine front with the minimal possible force needed to keep the bulk of the French engaged there. The main German force would be on the right wing, sweeping through neutral Belgium and then into France, descending on Paris and executing a massive envelopment manoeuvre which would trap the French army between the two German forces and lead to its rapid annihilation. The German divisions would then rapidly turn about to face France's ally, Russia, on the Eastern Front. The German plan falsely assumed Britain, not formally allied with either side, would remain neutral in the conflict, and deemed the relatively small British regular army too small to be of any impact even if it did get involved. France's frontier defences were based on a fortified zone from Verdun to Toul and isolated fortresses such as x�pinal and Belfort. To the north, France relied on the impassable terrain of the central Ardennes forest and the promise of Belgian neutrality. Thus Plan XVII called for a two-pronged offensive, north and south of the Verdun-Toul line. In the south, the First and Second Armies would attack into Lorraine. In the north the Third, Fourth and Fifth Armies would attack through the southern Ardennes towards Luxembourg. On the left flank of the Fifth Army, facing the Belgian frontier, was the BEF which concentrated near the fortress town of Maubeuge. On the French frontier, the German forces roughly matched the French in numbers and disposition, even to the point of being divided north and south of a fortified zone between Metz and Thionville. However, in Belgium to the north, opposing the French Fifth Army and BEF, were the German First, Second and Third Armies, forming the mass of Schlieffen's right wing. "If the Germans commit the imprudence of an enveloping manoeuvre through northern Belgium, so much the better! The more men they have on their right wing the easier it will be for us to break through their centre." 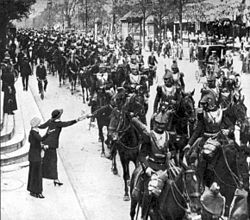 Picture - French heavy cavalry, wearing armoured breastplate and helmet, parade through Paris on the way to battle, August 1914. The first French attack of the war, known as the Battle of Mulhouse was fought on 7 August. It began in the south when the French VII Corps, along with 2 infantry and 1 cavalry division, advanced into southern Alsace with the objective of seizing the towns of Mulhouse and Colmar. Mulhouse was taken without a fight on 8 August, causing enormous celebrations in France, however a German counterattack commenced on 9 August, forcing the French to begin a slow withdrawal which was finished the next day. Joffre sent a division to reinforce the attacking force, but it arrived too late to prevent the fall of Mulhouse. In response to the repulse of VII Corps and the other divisions, Joffre sent four additional divisions to form the "Army of Alsace" under the command of retired general Paul Pau. The main French offensive in the south, known as the Battle of Lorraine, began on 14 August when the First Army of General Auguste Dubail advanced on Sarrebourg while the Second Army of General de Castelnau headed towards Morhange. The French moves were welcomed by the German Sixth and Seventh Armies under the combined command of Crown Prince Rupprecht - Rupprecht was in charge of the German forces assigned to meet and engage the French assault in the centre until they could be enveloped by the encircling German right wing. The German rearguards, equipped with machine guns, inflicted heavy casualties on the French infantry, still wearing their 19th-century style uniform of blue coat and red trousers. Crown Prince Rupprecht, dissatisfied with the defensive role assigned to him, petitioned his superiors to allow him a counter-offensive. This ran counter to the overall German plan of luring the French in, but on Rupprecht's repeated insistence the policy of defense in the centre was abandoned and a counter-offensive launched on 20 August against the French Second Army which was thrown back into France. This left the French First Army's flank in the air, forcing it to withdraw as well. Pau's Army of Alsace also had to pull back, despite having retaken Mulhouse. By 22 August, the French forces were back on their start lines along the Moselle River. The Schlieffen Plan, here and elsewhere on the front, now began to unravel as Crown Prince Rupprecht launched a full-scale offensive between Toul and x�pinal, starting on 23 August. However, the French forces were now occupying prepared defences and withstood the German attack, which lasted for four days. German forces locked into Rupprecht's offensive were therefore unavailable for the later fighting on the Marne when they may have proved decisive. Under Plan XVII, the French offensive against the German centre through the lower Ardennes was to involve the Third, Fourth and Fifth French armies, but by the time the offensive was due to start Plan XVII was beginning to crumble. General Charles Lanrezac, commander of the northern-most Fifth Army, alarmed by German progress in Belgium, sought permission to realign his forces away from the Ardennes and towards Belgium, shifting west into the angle between the Sambre and Meuse rivers. Joffre remained dismissive of the threat but on 12 August he allowed Lanrezac to move I Corps west to Dinant on the Meuse. When on 15 August Lanrezac reported German forces attacking Dinant, Joffre finally acquiesced, ordering the bulk of the Fifth Army to move north-west and take up positions behind the Sambre. In addition to the loss of most of the Fifth Army from the Ardennes offensive, Joffre also withdrew divisions to reinforce the Lorraine front following Rupprecht's counter-offensive. The Battle of the Ardennes commenced on 21 August with the attack of General Pierre Ruffey's Third Army towards Briey while the Fourth Army of General Fernand de Langle de Cary advanced on Neufchx�teau. The German Fourth Army (Albrecht, Duke of Wx�rttemberg) and Fifth Army (Crown Prince Wilhelm) had been making a methodical advance through the Ardennes since 19 August and on 21 August, the advance screens of the two forces collided in a confused series of skirmishes. The main forces came into contact on 22 August and in most cases the French infantry, attacking with a surplus of �lan but a shortage of supporting artillery, were defeated by superior German tactics, particularly in their use of entrenchments, machine guns and heavy artillery. There were isolated French successes, notably at Virton by the VI Corps but, by the evening of 23 August the French Third and Fourth Armies were in chaotic retreat, falling back on the line of the Moselle through Sedan, Stenay and Verdun. 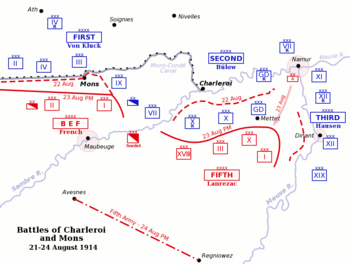 Picture - Map of the battles of Charleroi and Mons, 21-24 August. By 20 August, Lanrezac's Fifth Army had begun to concentrate on a 40 km front along the Sambre, centred on Charleroi and extending east to the Belgian fortress of Namur. On his left, the Cavalry Corps of General Sordet linked the Fifth Army with the British Expeditionary Force at Mons. Lanrezac's army of 15 divisions, weakened by the transfer of troops to Lorraine, was confronted by the 38 German divisions from the Second Army (General Karl von Bx�low) and Third Army moving south-west. Nevertheless, Joffre ordered Lanrezac to attack across the Sambre. Before he could act on the morning of 21 August, the German Second Army launched the Battle of Charleroi with assaults across the Sambre, establishing two bridgeheads which the French, lacking artillery, were unable to reduce. Bx�low attacked again on 22 August with three corps against the entire Fifth Army front. Fighting continued on 23 August when the French centre around Charleroi began to fall back. Meanwhile the German Third Army had crossed the Meuse and launched a frontal attack against the French right, held by a corps commanded by General Louis Franchet d'Esperey. The Third Army attack threatened to cut off Lanrezac's line of retreat but Franchet d'Esperey's force stopped the German advance and delivered a successful counter-attack. However, with the evacuation of Namur and news of the French Fourth Army retreating from the Ardennes, Lanrezac ordered a withdrawal. 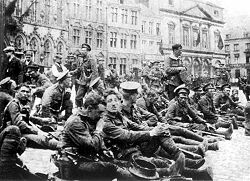 Picture - 22 August: "A" Company of the 4th Battalion, Royal Fusiliers, resting in the town square at Mons before taking up positions on the canal. On 22 August, BEF patrols encountered the cavalry screen of the German First Army of General Alexander von Kluck near Soignies south-west of Brussels. The British Commander-in-Chief Field Marshal Sir John French initially ordered an attack, believing he was confronted by an inferior force. In truth the BEF of five infantry and one cavalry divisions, 70,000 men, faced over 160,000 German troops - the mass of Schlieffen's right wing. Fortunately for the British, on the night of 22 August French chose to take up defensive positions along the Mons-Cond� Canal. The Battle of Mons began on 23 August when Von Kluck, required to maintain contact with Bx�low's Second Army on his left, launched a frontal attack on the British line with the main weight falling on the British II Corps of General Horace Smith-Dorrien. The massed rifle fire of the professional British soldiers - the Old Contemptibles - inflicted heavy casualties on the Germans who attacked en masse over terrain devoid of cover. The British held up the German advance until the evening when, now aware of the size of the opposing force, and with Sordet's cavalry in retreat leaving the right flank exposed, they began retiring to a second defensive line. For the moment, Von Kluck made no attempt at pursuit, allowing the BEF to disengage on 24 August. With the failure of Plan XVII, the French and British armies began the Great Retreat to the Marne River, pivoting on the fortress of Verdun. Fearing annihilation, Sir John French favoured withdrawing the BEF to the coast of the English Channel from where it could be evacuated but the British Secretary of State for War, Lord Kitchener, despite having never favoured the BEF's role alongside the French army, now insisted they remain in contact. The Schlieffen Plan, while still on course, was beginning to come to pieces under the tentative control of Moltke. The opening of the Russian offensive in East Prussia and the unforeseen attack in Lorraine had drained the German right wing that was descending on Paris. Von Kluck's decision to take his First Army east of the French capital exposed his right flank which the Allies exploited in the First Battle of the Marne in early September, halting the German advance. For the French, their hope of a swift, decisive victory had evaporated and they now sought to avoid defeat. For Joffre, the reason for the failure of Plan XVII lay with his subordinates, claiming defeat stemmed from "grand shortcomings on the part of commanders." Any generals, of corps or division, who in Joffre's opinion had failed to perform were ruthlessly sacked. Despite the wisdom of his decision to retreat instead of counter-attack on 23 August, General Lanrezac was sent into retirement and replaced by Franchet d'Esperey, starting his rapid rise through the ranks. By the end of August, the French Army had suffered 75,000 dead of which 27,000 were killed on 22 August alone, making it a day to rival the first day on the Somme for bloodshed. Total French casualties for the first month of the war were 260,000 of which 140,000 were sustained during the climactic final four days of the battle of the Frontiers.